The Um Jurius fire base is near Syria's border and Sinjar mountain, where minority Yazidis fled to escape an ISIS genocide in 2014. 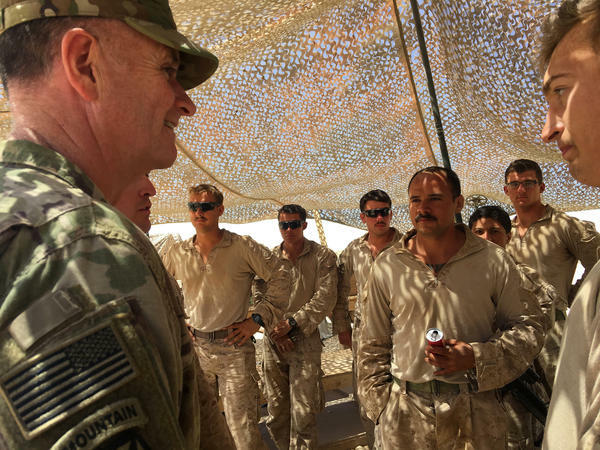 Maj. Gen. Walter Piatt, deputy commander of U.S. forces in Iraq, talks to Marines at the Um Jurius fire base, which supports Iraqi forces fighting ISIS. About 5,000 U.S. troops remain in Iraq. "They're pursuing any ISIS elements so they can't regroup and present a threat," Maj. Gen. Walter Piatt says of the Iraqi and Syrian forces the U.S. is backing. Piatt, the deputy commander for U.S. forces in Iraq, has brought NPR for a look at the remote base in Nineveh province, an example of the shifting role of the U.S. military in a conflict where 130,000 American troops once served in combat. The soldiers and Marines here are among the roughly 5,000 U.S. troops still in Iraq, as they focus primarily on training and advising Iraqi forces. To reach the base, Black Hawk helicopters leave from another U.S. military base in Irbil, the Iraqi Kurdish capital, and fly over Mosul, the Iraqi city where ISIS declared a caliphate four years ago and intended to erase the borders of Iraq and Syria. Last year, Iraqi forces drove ISIS out of Mosul, after nine months of what U.S. commanders described as the fiercest urban warfare since World War II. The helicopters fly along Mount Sinjar, straddling Iraq and Syria, where hundreds of thousands of Yazidis fled four years ago to try to escape ISIS genocide. An hour later, as the choppers land in the desert at Um Jurius, they kick up a pale, fine-grained sand that hangs in the air and settles like powder. For the past month, about 150 soldiers and Marines have been deployed at Um Jurius from Fort Hood, Texas, and Twentynine Palms, Calif. 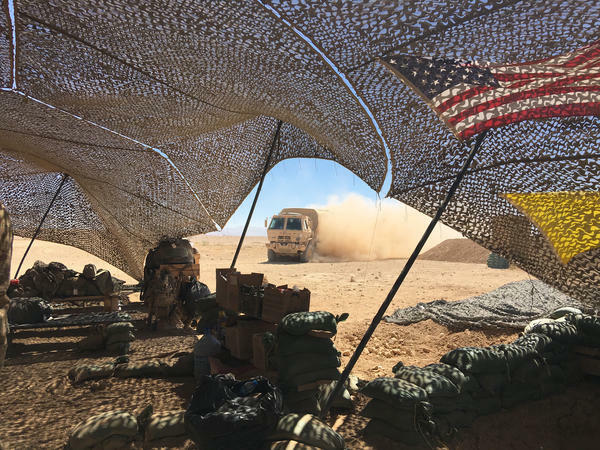 The base, shared by U.S. and Iraqi forces, is called a fire base because it provides artillery fire support for ground troops — in this case, Iraqi and U.S.-backed Syrian forces. Few of the U.S. soldiers at the base are aware of what happened a few miles away four years ago, when ISIS killed thousands of Yazidis and forced thousands of women into sexual slavery. The plight of the Yazidis, members of a terrorized religious minority trapped with no food or water after they escaped to Mount Sinjar, helped bring the U.S. into the war against ISIS in 2014. "The big picture, I think, we're just trying to take care of destroying the enemy – trying to support the Iraqis and Syrians as they fight ISIS," says Sgt. Jason Powell from the 4th squadron 3rd Cavalry Regiment. Powell, from Louisville, Ky., and his crew take their positions in front of a howitzer, a huge artillery gun facing in the direction of Syria. The targets are requested by a forward spotter and, after other checks to make sure they are legitimate, Powell receives instructions on his tablet computer on the type of shells and charges needed. "We've been out 27 days and we've shot about 30 times out here — most of it is terrain denial," says Powell, referring to blowing up avenues of approach such as bridges or other territory to prevent ISIS from re-entering. The U.S. military says it takes care to avoid civilian casualties. The field artillery soldiers never see the targets they are firing at, more than 10 miles away. It's the first deployment for many of these soldiers. "You train, train, train, and then you actually get to do some combat — that's priceless experience," says Lt. Aaron Palumbo, a platoon leader from Orlando, Fla.
Out in the desert with no Internet or TV, in a camp they essentially built themselves, the men have bonded. Pvt. Luis Villegas, 20, emigrated to the U.S. from Mexico. He'd wanted to join the U.S. army since he was 15 because "there was honor in it," he says. "I believe that if I serve with these men right here, right next to me, I'm going to learn many things that will help me in the future," he says. "Love. Love — that's the primary thing, and to value friendship and the people I have around me." Another U.S. soldier, originally from the Philippines, has served six previous military deployments in Iraq. As Piatt walks around, Iraqi soldiers and officers who share the base stop to take selfies and other photos with him. "I always like to work with the Americans because they are very accurate," says Iraqi Army Maj. Ahsan Ali, who greets Piatt with a snappy salute after shouting out his own name, rank and army unit. "And of course, there is friendship between us." On the Iraqi side of the base, artillery from the former Yugoslavia sits next to U.S.-manufactured, self-propelled artillery left by American forces when they pulled out of Iraq in 2011. Patchwork arms deals, some of them suspected to result from corruption, have left Iraqi forces with an array of equipment that is not always complementary. Keeping it all running requires ingenuity. "This 9th Division of the Iraqi army is one of the best divisions I've ever seen for maintenance," says Piatt. "The soldiers know how to fix things and they will actually repair the parts in order to get things fixed." Heavy losses in three years of fighting ISIS included 40 percent dead or wounded in some Iraqi units, and Iraqi security forces are now trying to regroup and rebuild. "The fight against ISIS is almost finished, but there are still pockets of them," says Iraqi Col. Mohammed Abed. "We are helping the Syrian Democratic Forces because the same terrorists are in Syria and Iraq." U.S. Marines from the 3rd Battalion 7th Marine Regiment protect the base and are responsible for maintaining contact with other security forces in the area. Nineveh province, which includes Mosul and nearby Sinjar, is the most diverse in Iraq. U.S.-backed Syrian Defense Forces and Syrian Kurdish fighters are battling ISIS across the border in Syria. The Iraqi side includes Yazidi forces and Iranian-backed paramilitaries that are now part of the Iraqi security forces. "By reaching out and building a relationship with them, it helps them understand that we are all part of one team — defeating ISIS — and it helps them feel much more comfortable and much more willing to work with us," says Marine Capt. Chase Kelley. He says he regularly meets with Iraqi and Yazidi commanders and talk to the paramilitary leaders by phone. On the Marine side of the base, a few paperbacks lie on a homemade wooden table. Lt. Paul Brown, from Palo Alto, Calif., is reading The Power of Habit, to learn tips on operating more efficiently. "We've made this place a home, so we're very happy with what we've built," says Powell, 27, pointing to showers and a water cooler they've rigged up. On the Iraqi side, there is a live sheep, destined for dinner. The Americans get by on packaged MREs — the military's Meals Ready-to-Eat. The most popular are chicken chunks and chicken stew. Sgt. Douglas Robert Moran, from Sparta, N.J., says his favorite is elbow macaroni with cheese. "It brings you back home — you know what I'm saying?" says Moran, 23. There are scorpions here, and flesh-eating camel spiders the size of a human hand that get into the tents at night. There is no air conditioning. The troops don't seem to mind. "It's very, very hot — I'd say about 110, but it cools off to the 80s or 90s at night," says Powell. "At night, you can really see all the stars." The soldiers often play cards with Iraqi soldiers in the evening. Some of them play chess. And the American soldiers and Marines meet to play their own form of baseball. It's likely what they'll do on the Fourth of July. "We got a few baseballs out here and we take the handle from a pickaxe and set bases up and have a good time," says Army Pvt. Clayton Mogensen, 22. "It boosts morale when we're not training."